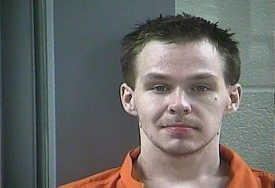 LONDON KY—On Wednesday, April 4th London Police were notified by Dispatch to check on a man at Dogwood Hills Apartments who was stealing from the garbage can from the laundry room. Through investigation, Jon A. Hyder, 25, of E. Pittsburg Church Rd. was arrested. Upon the arrival of K-9 Ofc. Greg Turner and Ofc. Steven Sparks at Dogwood Hill Apartments, they made contact with Hyder. It was determined through observation and standardized field sobriety tests that Hyder was under the influence of a controlled substance. Hyder then advised Police that he needed to return home because there were kids at the residence home alone. Police arrived at the residence on Village Street with Hyder and discovered four children, a 1, 2, and five-year-old as well as a 10-month-old child alone. The residence was not suitable to be in. Officers contacted Social Services Immediately and the children were removed from the home and placed with family members. Hyder was arrested by Ofc. Sparks and charged with public intoxication of a controlled substance and four counts of endangering the welfare of a minor. He was lodged in the Laurel County Detention Center.